I'm biased as a bus enthusiast, but I only see trams and light rail is "clogging up the roads," inconveniencing buses and cars and being hugely inflexible in where they go. The BRT alternative proposed (and under construction, correct?) looks very promising. Changing passenger preferences can be accommodated by changing the bus routes, or adding to them - and as always, my bleating point of get on close to your house, get off close to work in the city and avoid time-wasting connections. Its also prudent to note that I'd greatly prefer they stop flinging money everywhere now that the resources boom is largely done and dusted. W.A. 's 'housing bubble' is beginning to burst and by my reckoning, it is unlikely our growth will continue on the pathway of the last 15 years or so. So, having two dedicated lanes, the next point is how many people per hour do you need to move along them? The biggest viable bus in Australia (the single articulated) carries up to about 150 passengers. Trams carry anything from about 250 to 450 depending how long they are. Subject to system design, traffic lights etc, trams and buses can move along corridors at similar headways, so the trams can move many more people along a corridor. It's horses for courses, the appropriate mode for the capacity required. How much capacity do you need? Can buses provide it? As far as I'm concerned, that the trams will take over two lanes of the roads. And the worst to hit would be Albany Hwy/Kent St/Hayman Rd. This is really daunting for cars and trucks utilising this singe carriageway. Buses are still the preferable option than trams thanks to the future 960 from Curtin Uni - Mirrabooka. They really need more buses. It's like Apples for bananas. How many people would fit in a rigid bus? Is this viable? Shoudy Chen wrote: As far as I'm concerned, that the trams will take over two lanes of the roads. And the worst to hit would be Albany Hwy/Kent St/Hayman Rd. This is really daunting for cars and trucks utilising this singe carriageway. What has light rail got to do with Albany Hwy, Kent Street and Hayman Rd? The MAX Light Rail wasn't even originally planned for the south eastern suburbs, and Melbourne does have very functional tram lines, and drivers over there know how to share roads with trams, even if roads are singe carriageway as a result of the tram track. Merc1107 wrote: I'm biased as a bus enthusiast, but I only see trams and light rail is "clogging up the roads," inconveniencing buses and cars and being hugely inflexible in where they go. The fact that light rail is less flexible than buses is a good thing. It provides certainty for passengers and encourages development around stations. It's the same as heavy rail - everyone knows that in 30 years time Subiaco Station is going to be in exactly the same position, so people are happy to spend extra for that. Passengers are also comforted by the fact that infrastructure exists, so a service will arrive eventually. There's a reason why people prefer railways to buses. Encouraging people to make more connections is a good thing. Perth needs to get out of this mentality where everyone should have a direct bus service to the CBD - it's inefficient and encourages low-frequency services. Consolidating bus routes and requiring connections opens up the opportunity for faster, more frequent services - making public transport useful for journeys that don't start/end in the CBD. If you look at cities where public transport is widely used (London, Paris, Tokyo etc), connections are really common, because that's how frequencies can be maximised. Now is the exact time when the state government should be spending money on infrastructure. Construction costs are down significantly with many projects coming in under budget. With the economy not looking so great, government expenditure is vital in ensuring consumer confidence - cutting employment/spending dramatically would be awful for the state. The plan was always for MAX to go to Curtin via Albany Highway and Kent St using a dedicated right-of-way. Light rail in Perth would have been completely different to the trams in Melbourne - light rail vehicles and cars wouldn't share the road. Albany Highway would have had to be made one-way and some parking be removed. Kent Street would have to be widened, but not too much. It would be more comparable to the system in Sydney than what exists in Melbourne. Doesn't matter anyway because it's been scrapped now and there's little chance Labor will bring it back (they love the suburbs too much). We'll just have to put up with buses getting stuck in traffic for the foreseeable future. theenglishguy wrote: The plan was always for MAX to go to Curtin via Albany Highway and Kent St using a dedicated right-of-way. Light rail in Perth would have been completely different to the trams in Melbourne - light rail vehicles and cars wouldn't share the road. Albany Highway would have had to be made one-way and some parking be removed. Kent Street would have to be widened, but not too much. It would be more comparable to the system in Sydney than what exists in Melbourne. I driven the light rail routes in Perth and I can only say that I thought we had narrow streets here in Sydney but they're nothing on Perth's! I wonder what the historical reason for that was? Most of the narrower streets that Sydney's trams ran along were still 4 lanes wide, but some parts of the route to Curtin are barely more than 2 or 3 lanes. I'd say that if you wanted to insist on exclusive tram lanes you'd be demolishing the properties all the way down one side of the street. But it doesn't have to be like that. If the tram corridor is not all that busy and trams are at fairly lazy headways, which I suspect they would be to Curtin for much of the day, there's nothing wrong with lane-sharing with mixed traffic as long as there's appropriate road discipline enforced on other traffic. On the western end I can't understand why they want to terminate at the hospital when UWA is just a little further down the road. Generally I think the corridor from UWA via the CBD (Adelaide Tce or Murray/Hay one way each way) to Curtin would well-justify a tram line, with the northern corridor to consider later. If not that, then exclusive bus lanes and decent 100% low floor artics with plenty of doors, even better still as trolleybuses. That way at least you'd go a little closer to matching the capacity, environmental benefit and passenger experience of trams than with conventional buses or those silly little "BRT" buses. This might be a solution of a future plan linking across the city centre stretching from QEII Medical Centre and UWA right through to Curtin Uni and Canning Bridge Station. I suspect that they might be planning this light rail for the future to meet demand in Perth. Yes Canning Bridge is a logical connection. I'm confused. I thought "MAX" referred to the whole tram system but the ABC is suggesting it was only the northern line? Of course I favour priority for buses. I'm just not at all a "light rail" kind of person, that was highlighted in my 'original' posting and something of a disclaimer. Obviously the intention of the BRT is to avoid interfering with traffic as much as possible, and bus priority lanes do not always have to interfere with traffic, as we saw in the final iteration of the Kwinana Freeway bus-way, or even with "peak-only" bus-lanes. theenglishguy wrote: The fact that light rail is less flexible than buses is a good thing. It provides certainty for passengers and encourages development around stations. It's the same as heavy rail - everyone knows that in 30 years time Subiaco Station is going to be in exactly the same position, so people are happy to spend extra for that. Interesting point. However, the fact of the matter is Perth is going to go "up" in the inner-city regardless for those that want the inner-city lifestyle while continuing sprawling for those that don't care about ridiculous commutes. If people use a bus service enough, then the higher frequencies would certainly be more than enough certainty for passengers - take the 950 or Circle-Route, for example. People know they are there, and they most certainly use them. In terms of growth, however, I do not think Perth can continue going up and out indefinitely, and would personally like to avoid supporting that sort of growth. Our resources here are already stretched enough as it is (water-wise, especially). theenglishguy wrote: Encouraging people to make more connections is a good thing. Perth needs to get out of this mentality where everyone should have a direct bus service to the CBD - it's inefficient and encourages low-frequency services. I value simplicity. If one considers the average intelligence of the average population who don't want to care about public transport, then I think you will see people would ultimately prefer no connections. They add complexity (the "average joe," remember, does their laundry by "just putting clothes in and turning on") and I believe discourage people from using the system. Okay - added frequencies reduce waiting times, but I still see some of the freeway bus routes we still have (940, 881, 150, 158, 160) as beneficial in cases where the ultimate destination suburbs are quite "out of the way" compared to railway services or even feeder buses. Perhaps one day that will change, but I do not think these encourage low-frequency services. These run as often as any other suburban feeder service, if not more often. During peak it isn't uncommon to see standing loads as these services leave the bus-port, and generally not quite all at once. theenglishguy wrote: Now is the exact time when the state government should be spending money on infrastructure. Construction costs are down significantly with many projects coming in under budget. With the economy not looking so great, government expenditure is vital in ensuring consumer confidence - cutting employment/spending dramatically would be awful for the state. To close off yet another "thriller-length novel," I have to admit I'm surprised my thoughts actually elicited any type of response, given the quiet nature of the forums these days. Thanks for taking the time to give a nice rebuttal to my spiel. They need to get rid of the freeway bus routes as soon as possible because there is too much overload along Kwinana Fwy, especially during peak hour. How daunting will that be where you have 5 buses lining up along the freeway. Route 150 may need to be ditched asap because it shares the same route as 160 along EQBS and Booragoon Bus Station. Make it 160 only instead. 881, 940 should terminate at Booragoon, not EQ as there is too much duplication. Shoudy Chen wrote: They need to get rid of the freeway bus routes as soon as possible because there is too much overload along Kwinana Fwy, especially during peak hour. How daunting will that be where you have 5 buses lining up along the freeway. I think you'll find the cars, not the buses using the freeway are what cause congestion. The 150/160 do seem to follow a similar route - the former, however, continues on-wards to Fremantle and I suppose their frequencies are set so as there is even spacing between the two. Hang around EQBS one afternoon peak, and watch the freeway services as they leave. Even ride them, if you like. You should find they are a seated, perhaps even standing load, each and every one of them. This then increases again at Canning Bridge as a number of people connect from Northern/Southern-bound trains. Even the "Limited Stops" services (881 and 940) allow most of the stops through here due to the patronage levels. It is also wise to check out timetables for some freeway routes. The 111 and 158 do not operate weekends. The 148 replaces the 158 and goes to a terminus in Como, connecting via Canning Bridge at hourly intervals. That leaves just the 910 along Canning Highway, which does not use the freeway. Then the 881 and 940 at hourly intervals - but about 20 minutes apart. In any case, there is evidently enough patronage to justify these routes continuing. A number of the suburban feeders I have been on, however, seem to fail at accruing more than myself as a passenger during the day or even afternoons. This is another planned solution of a light rail along Hay Street. This will clog up some malls around the place. Since this discussion, I note that current mapping of the light rail route takes it across the city at Wellington St rather than getting tangled up in the issue of the malls and narrow bits along Hay and Murray. I prefer the Wellington St route, but think that it doesn't necessarily preclude switching over to Hay/Murray at the eastern and western ends (in fact it has to at the eastern end because of gradients). Will it still do the work of the Red CAT if predominantly along Wellington? The deviation to Subiaco option also seems to be dropped from consideration. It would be difficult one with Rokeby Rd being as narrow as it is, unless it was turned into a mall. Having now used Perth's buses extensively after several visits, I must say that I'm impressed at their ability to do some serious lifting, which minimises the need to consider more light rail, though the UWA to Curtin/Canning Bridge corridor is a definite candidate for light rail. I now consider that heavy rail is the one to go for on the main suburban corridors and the planning seems to have wisely firmed up on this. The major asset of Perth's trains is, not only their capacity, but their high average speeds that neither trams nor buses could possibly match over longer distances. The Perth public transport system really is quite different in quality from any other in Australia and imho is up at the level of the best European systems. I don't think other Australians fully appreciate this until they start using the bus system a lot. The quality of the Transperth trains is quite well known nationally, but the bus system is also leagues ahead of any other city in Australia and that fact is not well-known at all. It means for one thing that there is a higher threshold at which the alternative of replacing with light rail or train has to be considered than, for example, in Sydney where the bus system is quite poor and very capacity-constrained. The main thing I would like to see in Perth's buses, to get the maximum benefit out of them, is far more artics in the fleet for busy corridors plus transitioning to more efficient 100% low floor chassis (like Scania N series and MAN Lions CIty) and extending all-door entry to paid services, not just free ones. This would of course require more patrolling RPOs to replace the supervision by the driver, but the operational benefits in dwell times and efficient loading and distribution of passengers more than compensates. These measures would lift the efficiency of the buses even more and close the capacity gap between buses and trains a little, reducing the need to consider light rail down to corridors where it would really be of most benefit. Perth should also be seriously looking at electric buses by now in order to establish environmental credentials to match those of trams and trains. Where did this brainfart come from and is there really $60 million committed to it? The line looks like it starts in the south with an extension of the "knowledge arc" light rail north from Canning Bridge, along the existing freeway/railway alignment, misses UWA, then crosses the knowledge arc line again in the north to end up at Glendalough, then a proposal to take it across to Scarborough Beach. It seems to conflict with the knowledge arc line without serving any additional purposes, plus you can get from Glendalough to Canning Bridge much faster by direct train already. As for Scarborough to the CBD in 10 minutes! Prof Newman likes pushing light rail schemes but the reality of how they are put into practice in Australia is quite different. They are invariably very slow (except for GCLR which has full traffic light priority) and wouldn't offer any improvement (apart from higher capacity) over what the Perth bus system already offers. You can already get from Scarborough Beach to the city by bus and train in little over 30 minutes. A tram isn't going to be any improvement over that. It's a good objective to boost the connections between northern beaches like Scarborough and the city but the bus network already sets a very high bar that probably only a heavy-rail line would better. You will get higher capacity out of a tram line but not higher speed. tonyp wrote: You will get higher capacity out of a tram line but not higher speed. This is always a curious topic to me - a tram can theoretically offer better capacity, but what about speed? Buses can (to an extent) stop quickly, but heavy vehicles on steel rails cannot given the fairly low traction, or so I understand. In the inner city, where pedestrians with zero clue abound - does light rail have to operate at a lower overall speed for safety reasons? Merc1107 wrote: This is always a curious topic to me - a tram can theoretically offer better capacity, but what about speed? In other words, yes, they're quite capable of performing as well as a bus (maximum speed for both is determined by the road speed limit anyway), but with the new systems in Australia they drive them quite slowly unfortunately. Gold Coast is the only one that has a decent performance. That's why, as I've said before, PTA needs to get a proper hold on the subject and not leave it to "experts" who are now building up a significant CV for themselves on Australian projects but don't really know that much about it. I think PTA is clever enough to background themselves in Central Europe and run the project and set the standards for the operation themselves. DoT Queensland did that too, which is why GCLR is a better standard than the other newies. 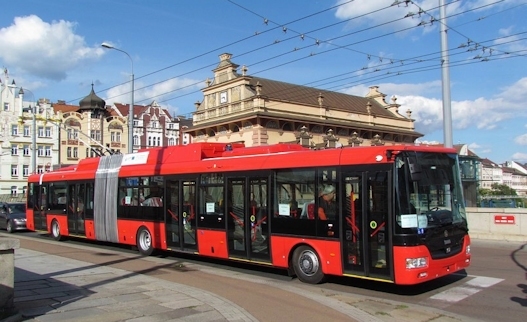 A tram is basically a higher-capacity bus on rails, not a train on the street. Unfortunately many new projects are treated like the latter. In theory, bus people should understand trams better than train people. In theory a trolleybus should have the best acceleration and braking but in practice they may use that advantage to fit smaller brakes and motors. Electric buses will be widespread one day. They're said to require about 80% less maintenance than a diesel and have a longer life. Because they use dynamic braking like a tram they're easier on the brakes. With their jerk-free acceleration and braking they meet part of the comfort argument of trams as well as the environmental credentials. What they won't have is the ride quality (unless the roads are perfect) and most importantly capacity. I think the main issue for Perth is to decide whether trams will offer all the capacity you need in the long term for a corridor or is it better to go straight to heavy rail? I think the "knowledge arc" corridor is good for trams but I don't share Prof Newman's enthusiasm for having them everywhere possible. After a bit of a detailed explore by bus, I figure that Wellington St is going to be the best route for a tram to cross the CBD, but ducking down Bennett and Hay at the eastern end to bypass the hill. What I'm wondering is whether when they put the entrance to the busport in the middle of Wellington, they took account of providing for a future pair of tram tracks passing by each side of it? Assuming this route, I don't see any engineering or ground space issues (accepting that there will be a road traffic compromise) between UWA and Victoria Park transfer station. The tough bit is getting between there and Curtin and the final connection to Canning Bridge. Probably not. I don't see how Wellington St (between William and Barrack) or any east-west corridor through the city is wide enough to accommodate trams without affecting the buses that go through it, and also the buses entering or exiting the underground busport. The three lane arterial roads of yesteryear are no more. I think the ground space is definitely there. Some sections of footpaths might have to be reclaimed near the station and general traffic reworked along the whole length. You're possibly thinking that buses and trams have to have separate lanes, but they don't. The important thing us to keep general traffic out of the public transport lanes. Buses and trams can even share stop platforms. That's very common in Europe and there are even a couple of examples of this in Melbourne. tonyp wrote: The important thing us to keep general traffic out of the public transport lanes. Ask practically ANY driver, and I think you'll find there is zero enforcement of any rule regarding bus lanes, buses merging and bus stops, unfortunately. As a result, traffic in and around the CBD is often chaotic, because of a major misunderstanding of road rules. Bus priority is also non-existent, despite all the busways and separate light sequencing for buses in numerous areas around the city... Those "Bus Lights" have their place in the light sequencing, and that isn't before anyone else, either... Try West-End Causeway lights, Canning Bridge, Fitzgerald St. (where buses exit Perth Busport), to name but a few. There needs to be significant ideological changes in the way traffic is allowed to move if any future light rail in Perth will be anywhere near successful. Otherwise, it will be no better than the status quo - what we have now. Yes I haven't failed to observe the abysmal state of traffic management and driving standards in Perth. I thought east coast cities were bad, but .... Obviously some government is going to have to take the problem by the teeth one day.